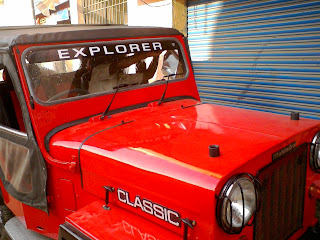 The re-born boy Mr.Mahindra Classic has also undergone a naming ceremony, As I have officially named my Jeep as Explorer. The name in reflectors sticked on the windshield and looks awesom. Hi Nivish, I could see how much you love Mahindra Classic from your post. But I got the same kind of love&interest towards my machine. Can't imagine my status without my jeep. To give you an idea of building a Mahindra Classic, you need to spend atleast 3L to 3.5L to make a good mahindra classic or buy a mahindra classic. There are few out there in punjab are on the sale, why don't you try out with people who are ready to sell and make your jeep special with your treatments?